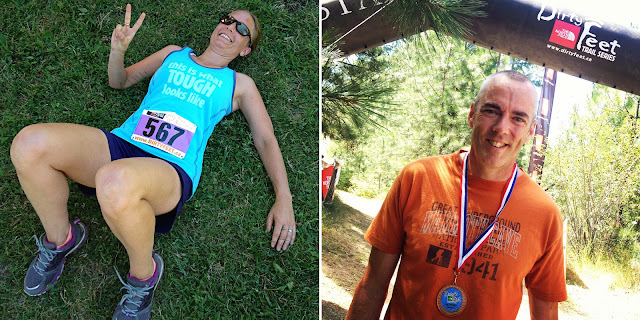 Last Sunday Chris and I ran the Dirty Feet trail run race in Kalamalka Lake Provincial Park. 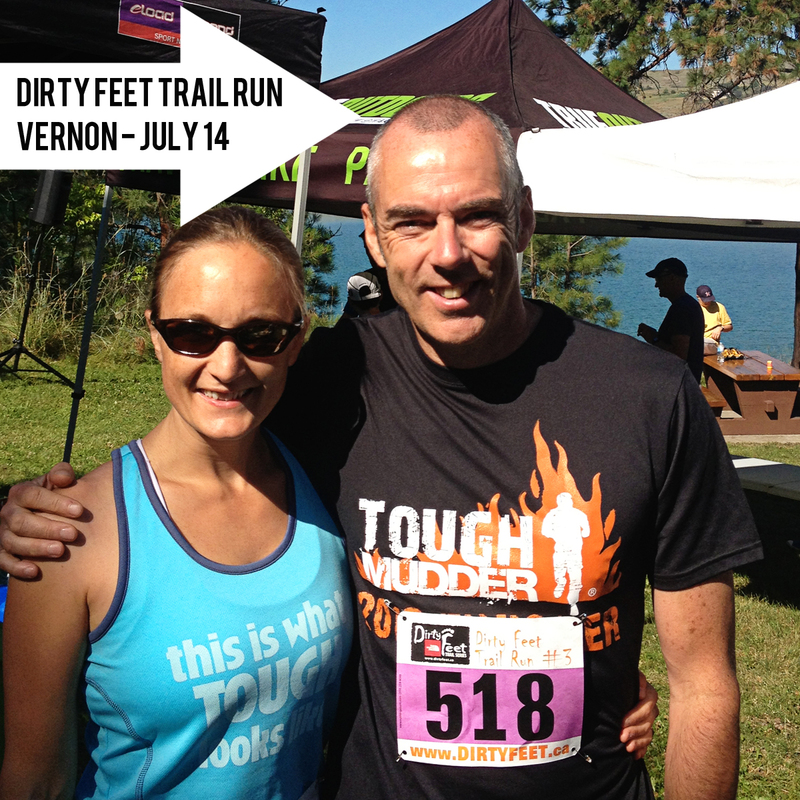 Dirty Feet host a number of trail running and mountain bike races throughout the summer (plus snowshoe runs in the winter). This was my 4th Dirty Feet race and once again I cannot say how well organized it is, how incredible the sponsors are and the very reasonable registration fees – it’s all just flat out awesome! We headed out early on race morning to leave ourselves plenty of time for packet pickup since we hadn't been able to get there ahead of the day itself. 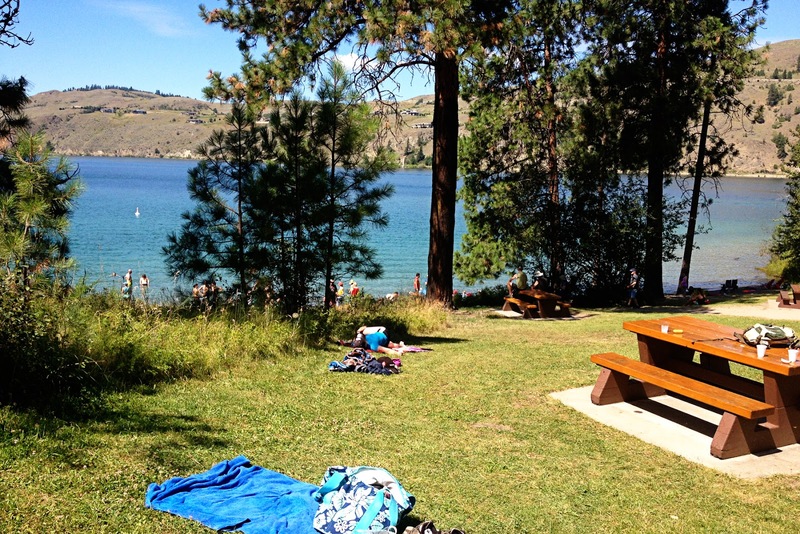 Kal Lake Provincial Park is such a pretty place on the shores of Kalamalka Lake. Interesting most (all I think actually) of the shoreline within the park boundaries is only accessible on foot – at least a 5 minute walk from any trail head or parking spot and some of the beaches are nearer a ½ hour walk! The start/finish line for our race was around 5 minutes down a steep hill to one of those beaches – it is an awesome spot!! One of us won a medal. The other is barely surviving!! Dirty Feet races lay on a mean snack table post-race – gotta love the big buckets of gummy bears, jelly beans, chips and crisps, granola bites, along with bananas and orange segments and plenty of eload and water to wash it down with. After grabbing a handful from the table we took the extra half dozen steps further for a dip in the lake to cool off. The water was gorgeous and clear, completely still and deliciously refreshing. I normally play around in the lake rather than actually swim, but today I set my sights on a buoy offshore and swam out and around that! Finish line with a view! And the perfect way to cool off! It was sometime after that Chris was speaking to the organizer about something else when she mentioned that he’d come in 3rd overall Male in the 5km!! Then of course it was even more reason to hang around – my man got a medal! And another thing… that totally rocks about Dirty Feet – their draw prize tables!! Seriously these guys rock the sponsorships and the table was chock full of clothing, vouchers, gadgets and more from the sponsors (it’s laid out ahead of time so you can ‘shop’ the prizes and check out what you hope to win! When they’re doing the draw there’s quite the adrenaline pumping when you’re hoping no-one ahead of you grabs the item you've got your eye on!) Anyway Chris, not only scored his medal and gift card to our local North Face shop for his third place result, he then got an early draw ticket and picked up a really nice long sleeved Arcteryx tech tee shirt – sa-weet! As for me, I was lucky to win a prize - I think my ticket came up about 5th from the end so it was slim pickings to choose from, but it goes to show how awesome all the gear was – I still lucked out with a nice pair of tech running socks! Another awesome race, and this is race 8 of 13 for me in my 13 in 2013 challenge this year! And once again I was out proudly representing Team Tough Chik, and for once with weather that was truly appropriate for my team tank! I'm linking up to Jill's Fitness Friday today! 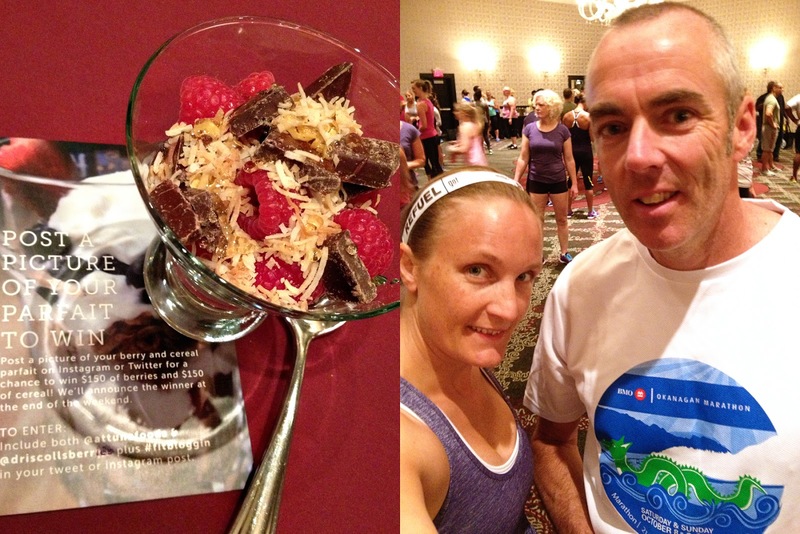 FitBloggin recap - part 2! There are plenty of trails along the river and I just stuck to those passing across 2 bridges to make a great lil’ loop on either side of the river, then cutting up through historic downtown for a little early morning urban sightseeing! 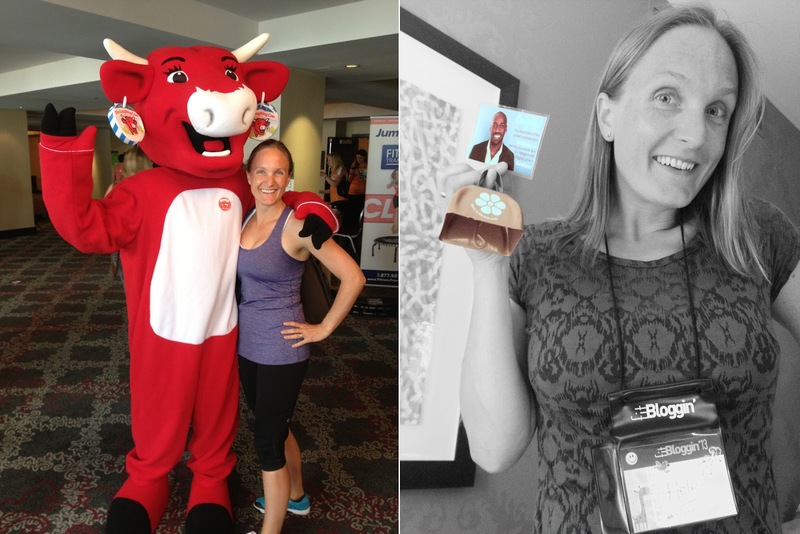 Hanging with the Laughing Cow at the vendor expo and me and my golden cowbell! Saturday morning was another bright start – 6am Yoga session with SweatPink. Given the early time it was a popular class and I really enjoyed it. I had time to grab my delicious breakfast (fresh fruit, bacon, pastries – all the things I love!) before heading off to a Discussion session on ‘How to set health & fitness goals’ with Erin. I was LiveBlogging this session – in fact volunteering for this role was the reason I was at FitBloggin’13 since I received a complimentary conference ticket in exchange for volunteering. It was a busy and popular workshop with a tonne of information – great for the participants (and me!) but crazy busy for me as I tried to capture everything. Live Blogging is an awesome way to get the information from the conference ‘out there’ for those that weren’t able to make it – and I’ve enjoyed reading up on some of the sessions I wasn’t able to attend, and I thoroughly recommend checking out the write-ups on the blog. I had a tough time with my choices of sessions on Saturday. In the end I went along to a Crossfit WOD (awesome - never done it before, now keen to try a full class as this was a mini demo class), How to Create a Media Kit and a workshop on Google Analytics (and kinda, managed to duck into the first half of a session on Improving your blog through SEO) As a pretty low-key blogger here at ‘What Happened Next…’ these tended to be more applicable to those with bigger and more pro blogs but since I help Chris with the behind-the-scenes stuff for InSpiral Coaching’s blog it’s fanatsic information as we work to grow his business in the future – there’s so much to learn, and the presenters were fantastic. Sadly the conference was drawing to a close and Saturday night was a reception hosted by those fabulous people at Nutrilite – yet more goodies from them, mini iPads and Tiffany necklaces as door prizes (not for me sadly) and some delicious hors d’oeuvres doing the rounds by the waiters. There was some karaoke and some dancing, plenty of margarita drinking and time with new friends. At the end of the night I headed back to my room exhausted and happy. This was the amazing swag we got from the sponsors - Reebok shoes, sports bags, t-shirt, sweat towels, months worth of supplements, protein bars, cereals, nuts, an awesome water bottle and so much more!! 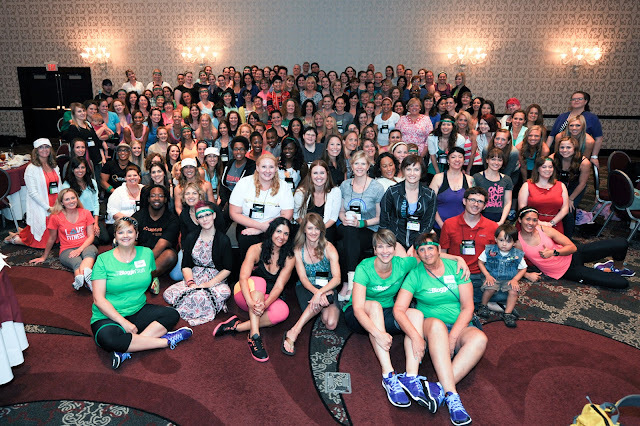 FitBloggin was an awesome experience - just the right mix of workout classes, blogging technique workshops and health and fitness workshops. Many attendees have been on amazing weight loss journeys and so there were a number of classes on that topic, so those weren't so applicable to me so much. I concentrated mostly on the blogging classes and was blown away at what a big business this is. Whilst I may not be growing this little blog much I'm keen to help over at InSpiral Coaching and my hope is that we can build that into something bigger with time (and knowledge & skills - exactly the kind of skills I was learning about at FitBloggin!) I'm keen to return next year! Happy Friday! 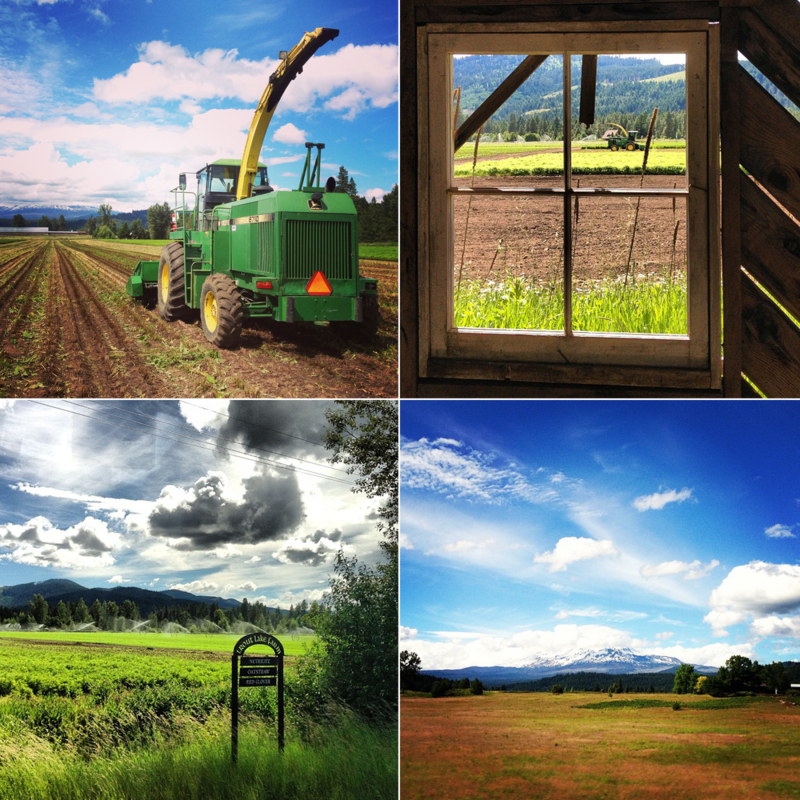 I''m linking up to Jill's Fitness Friday again this week. A year ago today little Miss Meli landed on the tarmac at Kelowna Airport and straight into our hearts. Those weeks waiting for her to come to us from Pointblank Dogs seemed to pass by at a snails pace, yet these last 365 days have flown by. I couldn’t imagine life without her. She has un-ending Vizsla energy (once she finally decides to get up in the morning!). Slowly but surely she’s learning to become my faithful running partner. We’re managing the short runs right now, with a few minutes at the start (and somewhere at the 4 mile mark) where we have a case of the crazies but on the whole when I look down at her cute wriggly bum she seems happy to be trotting along beside me. She doesn’t like venturing into the back garden for some reason – but once we coax her there she’s fine. She’s finicky with her food – getting bored of the bags after a few weeks so we try something new every time, she hates her nails being clipped, but our hardwood floors plead with us to do them regularly (but honestly Meli is more vocal so she usually wins that battle). She gets restless and needy if she doesn’t get some good off-leash time and exercise. She loves her doggy friends, oh, what am I saying – she loves everyone! You’ll be her long lost friend every time you see her – even if it was 5 minutes ago! She loves playtime at doggy daycare and sleep-overs at Auntie Liz’s and mopes around for a few hours when you first bring her home and away from her friends. She’s so well behaved in the house. She has never chewed, and is well trained to sit at our bedroom door and go no further – it’s her one no-go zone and she is brilliant at respecting that. She’ll sit patiently for her food and rings a bell at the front door when she needs to go potty. She likes roaming outside but if she sees a doggy friend she’ll be off – her one trouble-spot when it comes to discipline! She tolerates her leash (barely) preferring to run wild and crazy, and lucky for all of us we live so close to the woods. And after last year’s uncertainly she loves the water, and has a competitive edge when there’s one ball or stick and more than one dog – and usually she’ll win! If there’s no water she’ll happily take a giant ball of the white stuff – cold? – what cold?! Throwing snowballs (or water in the summer) at her is one of her favourite games – and she’s still not figured out there’s nothing there to actually catch! And just yesterday - the eve of her anniversary with us she's become a SUP dog - we're so proud! Yes, life as a family of 3 is good. Meli-mou we love you! Happy 1 year anniversary to us!